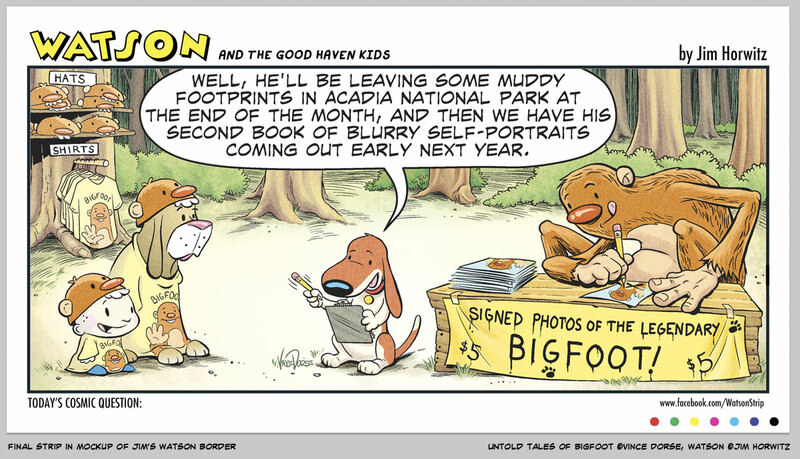 Looks like my Bigfoot & Scout characters had some new visitors to their neck of the woods! 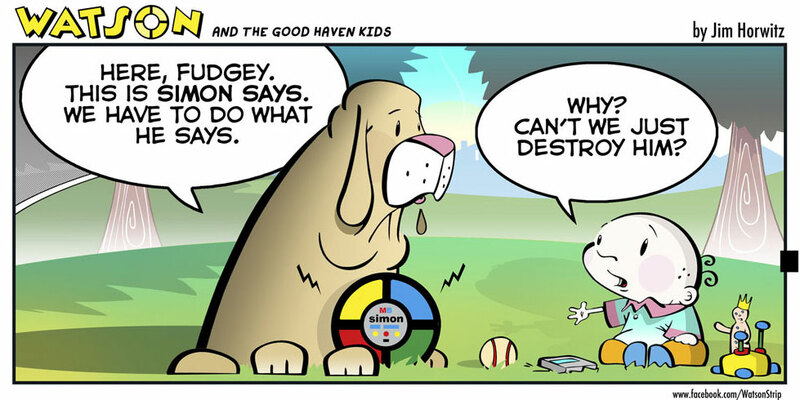 That’s Fudgey and his dog Watson, the main characters in the online comic Watson, created by cartoonist, family man and notorious nutball, Jim Horwitz. Jim came to me a while ago and asked if I’d be interested in collaborating on a Watson guest strip. Look at that winning smile. How could I say no? 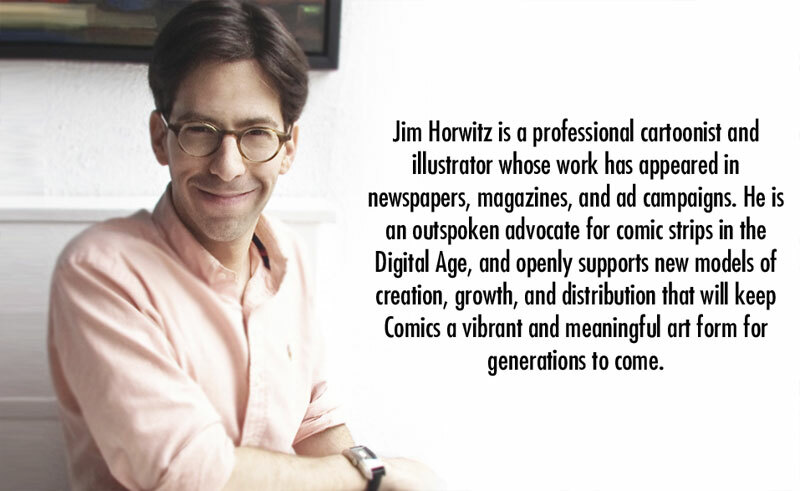 Not only is Jim a funny, talented cartoonist, he’s also a nice guy with a high-energy personality and some impressive writing chops. In fact, he wrote that last sentence. Here’s a recent Watson strip that’s a good example of Jim’s style. So, Jim had an idea for a gag where Watson and Fudgey meet Bigfoot and Scout, who are turning a decent buck selling Bigfoot merchandise. Jim had a script all written out, so I roughed out a first draft. I sketched directly in MangaStudio (ClipStudio Paint) this time. No pencil or paper, just digital. Jim hated it. Well, maybe hate is a strong word. But he did want some changes. He suggested I open up the space a little more, create some breathing room between the characters. Turned out to be a good note because, even though I was shooting for BIG and BOLD, the text Jim wrote wouldn’t have fit in my original composition. So I took another pass at the composition. I’ll admit…I didn’t run this second draft by Jim because I was afraid he’d have more changes and, frankly, I did not have time for those kind of shenanigans. But I was pretty confident I nailed the aesthetic he was looking for (hope so, anyway). I jumped into to the inking phase. Inks were done in MS with a standard brush. I didn’t try to match Jim’s style — a dynamic mix of stylized blocks of borderless color and lines so thick and heavy you could use them to beat someone unconscious. I just went with my standard style, hoping it would do Jim’s idea justice. I laid down my flat colors in MS, but went a little lighter and brighter than I normally would. Afterward, I exported the file, converted to RGB and used Photoshop adjustment layers to brighten and saturate the colors even further. In the end, what I sent to Jim wasn’t quite as bubbly as his usual strips, nor was it as mellow as my usual color palette. A decent, middle-ground. Here’s a close-up of some of the modeling I did on the trees and figures. All done in MangaStudio. Jim’s strip is very sharp and crisp, but since this was my guest strip I decided to throw all that out the window and try something different. 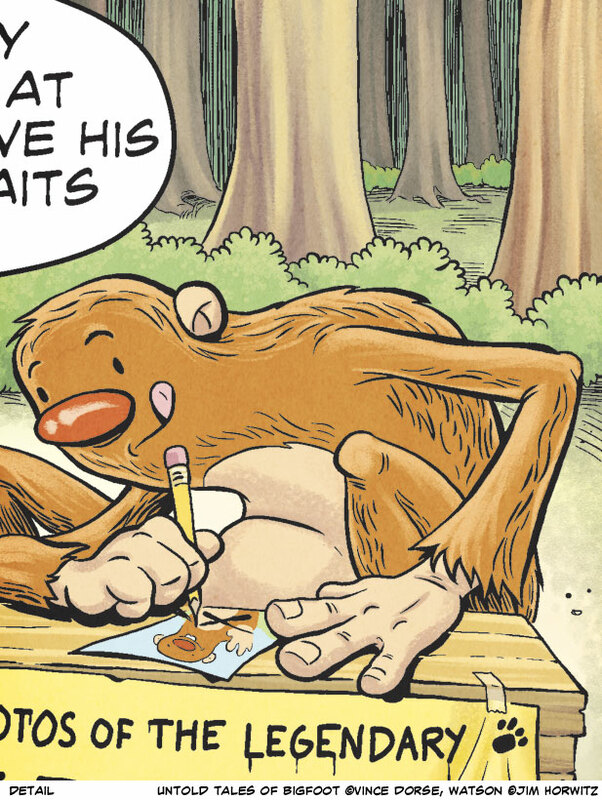 I used soft, textured brushes to model the trees, and built up the highlights on Bigfoot’s fur with some rough-edged, low-opacity brushes to give him a nice, warm, fuzzy feeling. Did Jim like it? I don’t know. But what’s he gonna do? Recolor it? With his deadlines? I’d like to see him try. In case it’s of any interest, here’s what my colors look like without the ink lines.